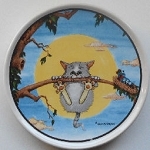 This cat picture frame ornament is the perfect place to insert a picture of your special cat. The ornament is 2 3/4" wide x 3 1/8" high. Displays a photo 1 3/4" high x 1 1/2" wide. 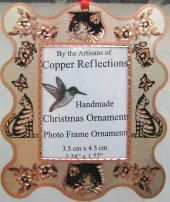 The frame is made of recycled copper. It is silver coated then diamond cut to produce a tri-color appearance. A protective coating is applied so it never needs polishing. Red ribbon attached for hanging.